Press Information about White Towel Services, Inc.
Salt Lake City, Utah - January 30, 2006 - White Towel Services announced today its newest product Go! Towels. The innovative packaging of Go! Towels let you take the refreshment of our 100% terry cotton washcloths on the road. Four pre-moistened lightly-scented towels are packed in a resealable package that can be heated or cooled for your convenience. Go! 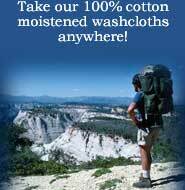 Towels are perfect to take camping, hiking, car-trips, sports events and more! This marks the first foray into direct retail products for White Towel Services. The first retail units will appear in Sportsman's Warehouse stores in mid-February. Go! Towels are available for purchase online at www.go-towels.com. They retail for $3.99 a pouch of four towels and are also available is case sizes of 20 and 160 pouches. Established in 2001, White Towel Services, Inc. was founded by Jason Stark in a belief that America was missing the essence and quality of Oshibori. They specialize in hot towels based upon the Oshibori ideals and can be found in many industries: airline, hotel, restaurant, golf courses, country clubs, dentist offices, and more! For more information, contact Jason Stark at (817) 868-7900 or visit our website at airline-towels.com.